You are here: Home / Owner’s Manual / Compliance / Carrying the Employment Law Compliance Burden Alone? Ah the good old days, when you could start a business and your eventual success depended largely on your creativity, intelligence and hard work. Then something changed. And those changes, once begun, started rolling and building like a snowball rolling right toward virtually every small business in America. So what changed? Employment Laws and Regulations, and they now touch virtually every aspect of your business. In 1990 there were just 2 employment related laws; Case Law & Common Law. By 1940, that total was up to a total of 10 employment related laws. But they were just warming up! Today, employers are tasked with knowing and adhering to is no less than 68 separate laws and regulations. It’s a mind numbing alphabet soup that is daunting enough to bring any burgeoning entrepreneur to their knees. Feel like you’re losing the employment law compliance game? It’s clear that the playing field has changed and business owners have to adapt their operating strategies accordingly. One such strategy is to partner with a Professional Employer Organization or PEO. Simply put, when a business owner partners with a PEO, they are dividing the responsibilities around employing their people. With the PEO, they create two employers for each of their employees. The business owner remains “the boss”. They hire, fire, train, set wages, do performance reviews, and direct work activities. Kind of like in the “good ole days”. The PEO though becomes the “employer of record” and this is the magic of PEO’s. This status allows the PEO to be primarily responsible for the minefield of compliance freeing the business owner to focus their efforts on growing the business. Examples of what a PEO does for their clients includes: payroll, payroll taxes, administering benefits plans, provide Workers Compensation insurance and workplace safety support, helping to develop policies and handbooks, handling garnishments and child support orders, and the list goes on but hopefully you get the idea. The PEO expertly handles all the administration around employment while the business owner runs the business. To the client’s employees it’s pretty invisible except for the possibility of a more robust benefits package. And because the PEO has many clients, each individual client shares in just a small portion of the cost of the PEO’s systems and expertise. See our diagram of the PEO model here. In fact, according to the Society of Human Resource Managers (SHRM) in their 2009 Human Capital Management Study, A PEO can handle the administrative side of employment for their clients for about 30-50% less than it would cost the employer to do it themselves. And PEO’s are experts at doing it! All the time and effort the business owners would have put into employment administration is now focused on driving revenue or just spending time on the more important things in life. PEO’s are not for every business, but when there is a fit, it’s a real game changer. In fact, once a business owner starts using a PEO, it’s VERY rare for them to decide to take it all back “in house”. Regardless of the strategy used to deal with the complex world of risk and regulation, it’s clear that for small business owners, things are not getting any easier. In fact, with Healthcare Reform in full bloom, it’s critical to secure a strategy to find a trusted guide for the business today and into the uncertain days to come. PEO’s are definitely worth a look. 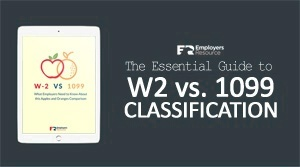 https://www.employersresource.com/wp-content/uploads/2014/05/Carrying-the-Employment-Law-Compliance-Burden-Alone.png 1024 1024 Mary Gersema https://www.employersresource.com/wp-content/uploads/2016/07/employers-resource-national-PEO-strength-local-service.png Mary Gersema2014-05-06 09:00:112016-10-14 16:00:46Carrying the Employment Law Compliance Burden Alone?